Donna has been studying and practicing the Barkan Method of hot yoga intensively since 2004 and has found her efforts to be a truly life transforming experience, one that carries forward for her to this day. She has found her personal transition from practitioner to instructor to be seamless experience, prompting her decision to share this gift of yoga with others. Donna’s positive energy and encouragement empowers her students raise their confidence levels, better enabling them to achieve their full potential. Her classes focus on increasing strength, stamina and flexibility, while paying particular attention to alignment. Donna’s endearing nature and patience has proven to attract students of all levels, connecting with and inspiring them to realize their true self and purpose. The practice offers many physical, emotional, intellectual and spiritual benefits but the aim is enlightenment, or simply put, the state in which everything fits together. Donna is certified to teach the Barkan Method Level I and Vinyasa Levels II & III. She makes every effort to practice with her mentor, Jimmy Barkan regularly. 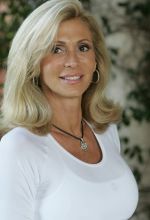 Donna teaches at the College of India and the Yoga Connection. Additionally, she volunteers at Gilda’s Club, offering a restorative flow with guided meditation to recovering cancer patients and has spearheaded a yoga program for local teenage softball teams. She is available for group and private instruction.